Communication is simply the act of transferring information from one place, person or group to another. Every communication involves (at least) one sender, a message and a recipient. This may sound simple, but communication is actually a very complex subject. The transmission of the message from sender to recipient can be affected by a huge range of things. These include our emotions, the cultural situation, the medium used to communicate, and even our location. The complexity is why good communication skills are considered so desirable by employers around the world: accurate, effective and unambiguous communication is actually extremely hard. This page explains more about what we mean by ‘communication’. communication, n. The imparting or exchanging of information by speaking, writing, or using some other medium. …The successful conveying or sharing of ideas and feelings. As this definition makes clear, communication is more than simply the transmission of information. The term requires an element of success in transmitting or imparting a message, whether information, ideas, or emotions. A communication therefore has three parts: the sender, the message, and the recipient. The sender ‘encodes’ the message, usually in a mixture of words and non-verbal communication. It is transmitted in some way (for example, in speech or writing), and the recipient ‘decodes’ it. Of course, there may be more than one recipient, and the complexity of communication means that each one may receive a slightly different message. Two people may read very different things into the choice of words and/or body language. It is also possible that neither of them will have quite the same understanding as the sender. In face-to-face communication, the roles of the sender and recipient are not distinct. The two roles will pass back and forwards between two people talking. Both parties communicate with each other, even if in very subtle ways such as through eye-contact (or lack of) and general body language. In written communication, however, the sender and recipient are more distinct. There are a wide range of ways in which we communicate and more than one may be occurring at any given time. Spoken or Verbal Communication, which includes face-to-face, telephone, radio or television and other media. Non-Verbal Communication, covering body language, gestures, how we dress or act, where we stand, and even our scent. There are many subtle ways that we communicate (perhaps even unintentionally) with others. For example, the tone of voice can give clues to mood or emotional state, whilst hand signals or gestures can add to a spoken message. Written Communication: which includes letters, e-mails, social media, books, magazines, the Internet and other media. Until recent times, a relatively small number of writers and publishers were very powerful when it came to communicating the written word. Today, we can all write and publish our ideas online, which has led to an explosion of information and communication possibilities. Visualizations: graphs and charts, maps, logos and other visualizations can all communicate messages. The desired outcome or goal of any communication process is mutual understanding. The process of interpersonal communication cannot be regarded as a phenomena which simply 'happens'. Instead, it must be seen as a process that involves participants who negotiate their roles with each other, whether consciously or unconsciously. A message or communication is sent by the sender through a communication channel to one or more recipients. The sender must encode the message (the information being conveyed) into a form that is appropriate to the communication channel, and the recipient then decodes the message to understand its meaning and significance. Misunderstanding can occur at any stage of the communication process. Effective communication involves minimising potential misunderstanding and overcoming any barriers to communication at each stage in the communication process. See our page: Barriers to Effective Communication for more information. An effective communicator understands their audience, chooses an appropriate communication channel, hones their message for this particular channel and encodes the message effectively to reduce misunderstanding by the recipient(s). They will also seek out feedback from the recipient(s) to ensure that the message is understood and attempt to correct any misunderstanding or confusion as soon as possible. Receivers can use techniques such as Clarification and Reflection as effective ways to ensure that the message sent has been understood correctly. A message or communication is sent by the sender through a communication channel to a receiver, or to multiple receivers. The sender must encode the message (the information being conveyed) into a form that is appropriate to the communication channel, and the receiver(s) then decodes the message to understand its meaning and significance. An effective communicator understands their audience, chooses an appropriate communication channel, hones their message to this channel and encodes the message to reduce misunderstanding by the receiver(s). They will also seek out feedback from the receiver(s) as to how the message is understood and attempt to correct any misunderstanding or confusion as soon as possible. Communication channels is the term given to the way in which we communicate. It is therefore the method used to transmit our message to a recipient, or to receive a message from someone else. There are multiple communication channels available to us today. These include face-to-face conversations, telephone calls, text messages, email, the Internet (including social media such as Facebook and Twitter), radio and TV, written letters, brochures and reports. Choosing an appropriate communication channel is vital for effective communication. Each communication channel has different strengths and weaknesses. For example, broadcasting news of an upcoming event via a written letter might convey the message clearly to one or two individuals. It will not, however, be a time- or cost-effective way to broadcast the message to a large number of people. On the other hand, conveying complex, technical information is easier via a printed document than a spoken message. The recipients are able to assimilate the information at their own pace and revisit anything that they do not fully understand. Written communication is also useful as a way of recording what has been said, for example by taking minutes in a meeting. See our pages: Note Taking and How to Conduct a Meeting for more. All messages must be encoded into a form that can be conveyed by the communication channel chosen for the message. We all do this every day when transferring abstract thoughts into spoken words or a written form. However, other communication channels require different forms of encoding, e.g. text written for a report will not work well if broadcast via a radio programme, and the short, abbreviated text used in text messages would be inappropriate in a letter or in speech. Complex data may be best communicated using a graph, chart or other visualisation. Effective communicators encode their messages so that they fit both the channel and the intended audience. They use appropriate language, conveying the information simply and clearly. They also anticipate and eliminate likely causes of confusion and misunderstanding. They are generally aware of the recipients’ experience in decoding similar communications. Successful encoding of messages for the audience and channel is a vital skill in effective communication. You may find our page The Importance of Plain English helpful. Once received, the recipient needs to decode the message. Successful decoding is also a vital communication skill. People will decode and understand messages in different ways. This will depend on their experience and understanding of the context of the message, how well they know the sender, their psychological state and how they feel, and the time and place of receipt. They may also be affected by any Barriers to Communication which might be present. There are therefore a wide range of factors that will affect decoding and understanding. Successful communicators understand how the message will be decoded, and anticipate and remove as many as possible of the potential sources of misunderstanding. The final part of a communication is feedback: the recipient lets the sender know that they have received and understood the message. Recipients of messages are likely to provide feedback on how they have understood the messages through both verbal and non-verbal reactions. Effective communicators pay close attention to this feedback as it is the only way to assess whether the message has been understood as intended, and it allows any confusion to be corrected. Bear in mind that the extent and form of feedback will vary with the communication channel. Feedback during a face-to-face or telephone conversation will be immediate and direct, whilst feedback to messages conveyed via TV or radio will be indirect and may be delayed, or even conveyed through other media such as the Internet. Effective communicators pay close attention to this feedback as it is the only way to assess whether the message has been understood as intended, and it allows any confusion to be corrected. You may be unsure if a message has been successfully received and decoded, especially if you do not get much feedback from the recipient. If so, you can always ask! 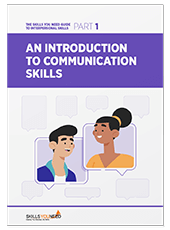 Understanding more about communication and how it works is the first step to improving your communication skills. A good understanding of the process, and how it operates, will help you to ensure that you become better at encoding and decoding messages.